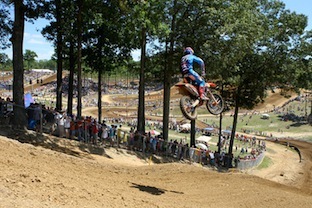 The 2012 Pro Motocross Championship hosted its fifth round of the season with the annual visit to Southern Maryland and Budds Creek MX Park. The Red Bull Budds Creek National, from Mechanicsville, challenged riders on one of the most renowned tracks in the country and also signified the debut race broadcasted live on network television on NBC. The races were covered live with 15+ cameras for Lucas Oil Productions. For the third year Peter Roof operated hard camera #7 at the base of a jump and large hill (pictured). It was loud, dirty, and smelly but the weather was not as hot for a June afternoon. The broadcast was also sent to the web and to the Fuel Network. Photo from top of hill before camera 7 position (credit: GuyB/vitalmx.com).